The purple coneflowers and helenium dancing in the garden were just begging to be picked. 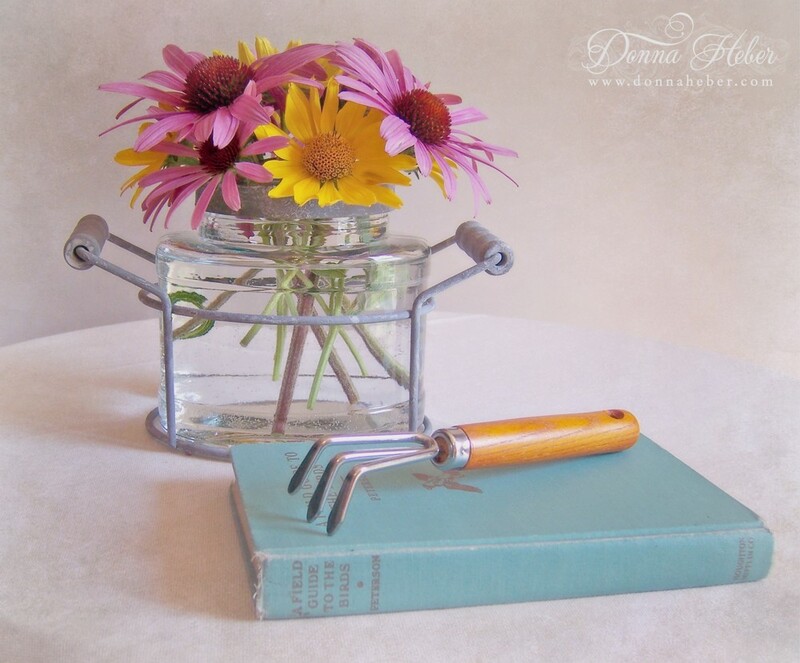 I've arranged them in this farmhouse style glass and zinc holder. 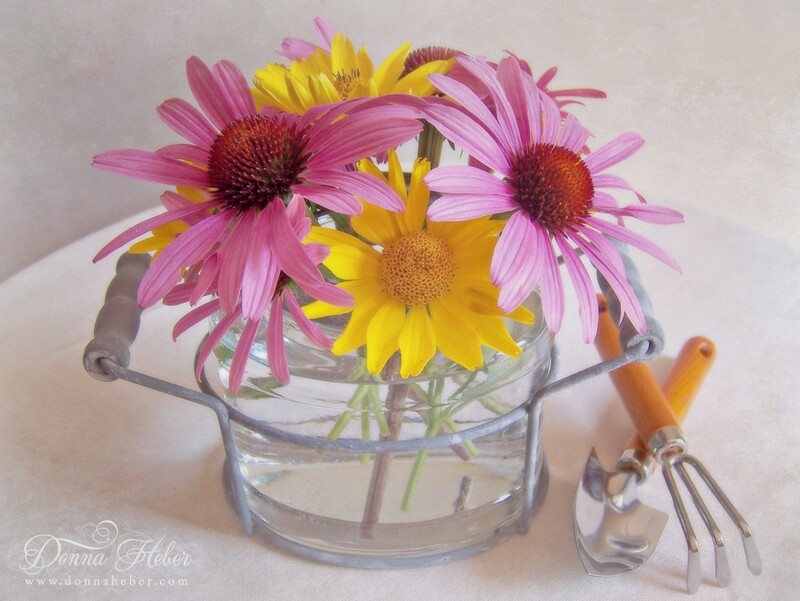 It is a nice alternative to a mason jar or vase to enjoy your flowers. Once the blooms fade, I envision this holder on the kitchen counter with wooden spoons or in the craft room filled with a bouquet of paint brushes. The vintage book is the 1962 edition of Roger Tory Peterson's Field Guide to the Birds, which belonged to my husband's uncle. He was a World War II paratrooper who was captured by the Germans on D-Day, June 6, 1944 . For the remainder of the war he was in a POW camp, but eventually was liberated. He didn't like to speak about his experience; however, I can't imagine how these events impacted his life. 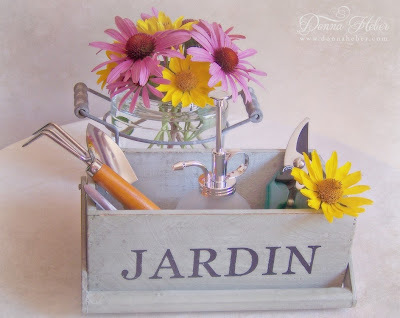 Last year while treasure hunting I spotted this charming garden box. 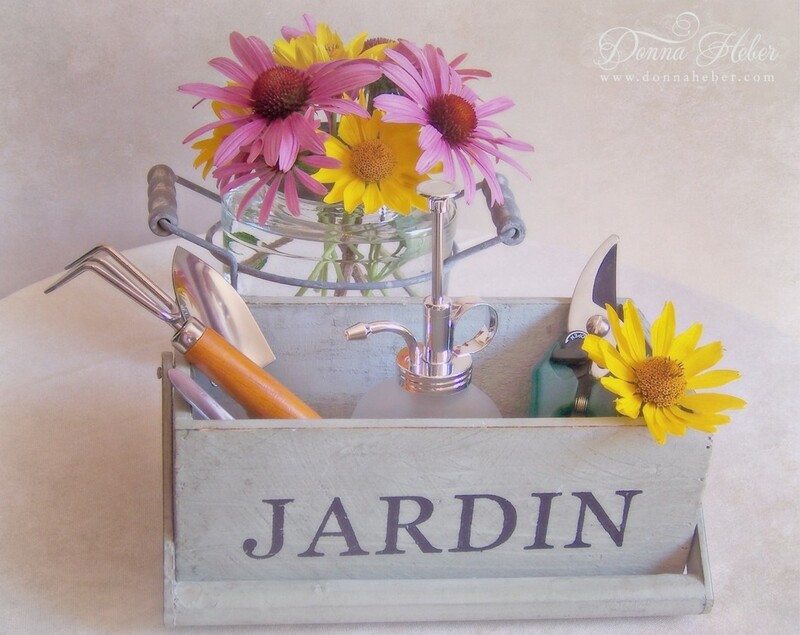 In French, the word 'Jardin' means garden. I thought it would make a nice herb planter or since it has a handle I could use it to store some garden items or cutters. It has a nice sage green rustic finish. I hope wherever you are today it is sunny and bright. I love mason jars, but this little thing is just the cutest and has a farmhouse feel. Sweet, sweet, sweet! 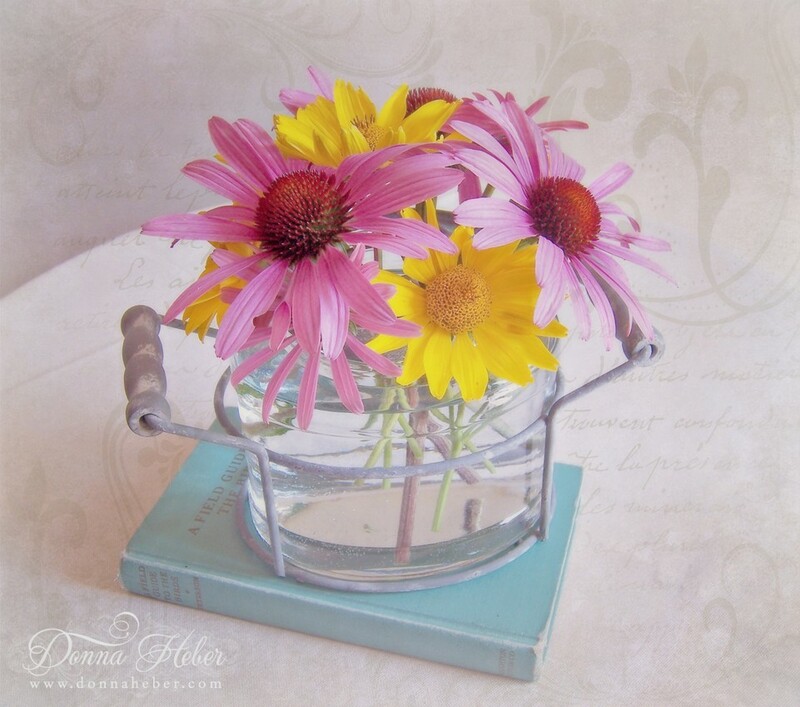 so colourful flowers and great photo's Donna. I love to go treasure hunting too! The flower holder is fabulous! 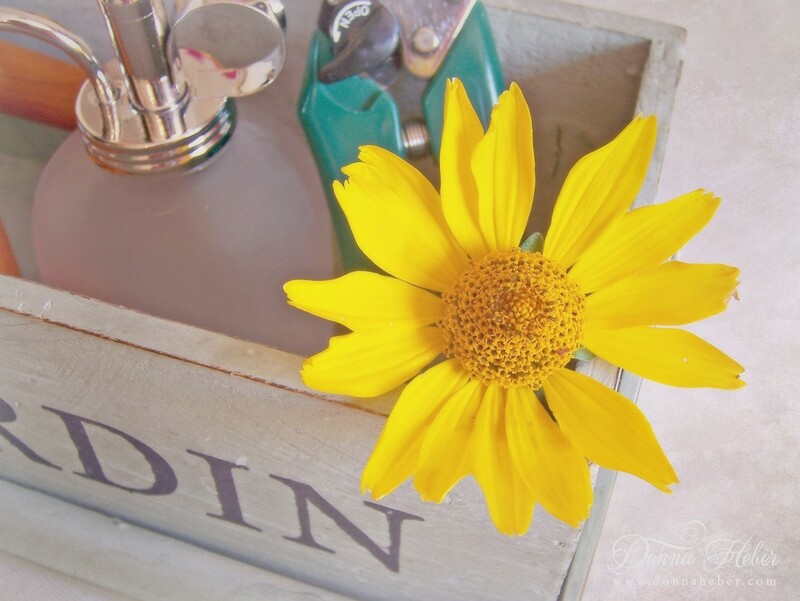 Liked your pretty vignette, and that adorable lil Jardin box, so cute. Beautiful flowers too, love those cone flowers especially. Also loved your neat container you had them in, very pretty. 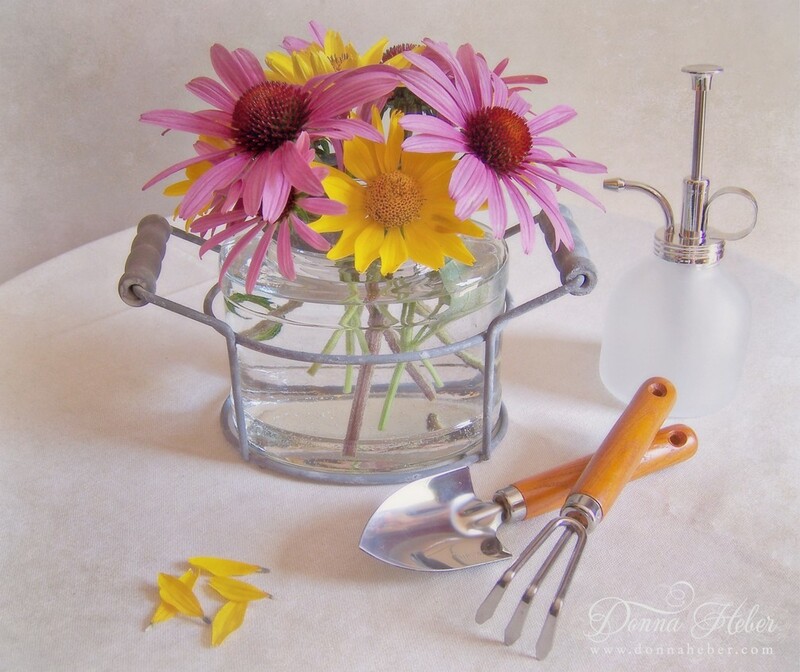 You have all kinds of neat vessels in which to put your lovely flowers! I love your containers. I'm prepping for a card class today. Hope you enjoy the sun too. So pretty and sweet. I love those flowers together. Purple and yellow are August colors to me. Your little jar is great. In my house it would hold beach glass or small shells and would sit in my kitchen.